Our flight to Athens was at 5pm on Tuesday. This gave us the morning in Paris with plenty of time to get to the airport. We landed in Athens at 9pm and took the Metro into central Athens. The ride took about an hour and by the time we got back to our hotel, we were pretty tired. We checked into our hotel and promptly headed upstairs to the rooftop bar for a glass of wine, and immediately saw this. The view of the Acropolis from our hotel bar. It was breathtaking. All of a sudden, it hit us...we were in Greece. I mean, this was Ancient Greece...and it was gorgeous. A few glasses of wine and it was time for bed. We wanted to get an early start to the next day since we only planned one full day in Athens. We had planned a tour that was gifted to us from our honeymoon registry and we started at the Acropolis. We didn't go through the central entrance (which I've heard is the easier one), rather, we started at one of the side entrances near the Theater of Dionysus and then walked all the way up to the Parthenon. We spent a few hours just wandering around the and the Acropolis grounds. From there, we ended up in Monastiriki, where we stopped off for some gelato. I hate pistachio and The Pilot had chocolate strawberry. It was really hot out, so it was a nice, refreshing snack before we continued on our way. From Monastiriki, we took the metro to Syntagma Square and started by watching the changing of the guard at the Greek Parliament. 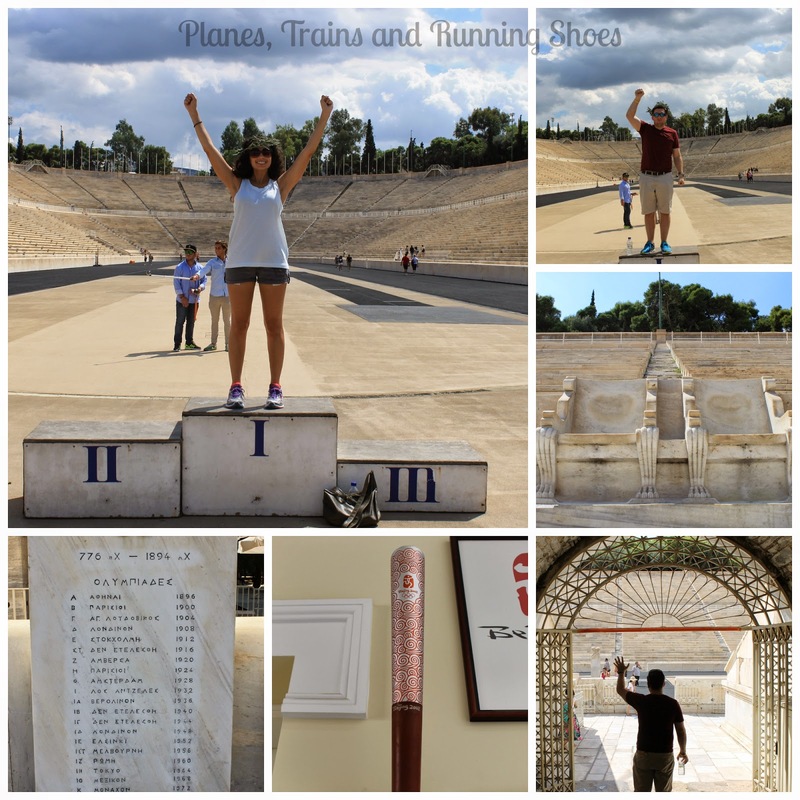 From the Parliament building, it was just a short walk to the National Gardens, which we cut through to get to the Panathenaic Stadium, where the first Olympics were held in 1896. The Olympic Stadium was awesome. It was so cool to see. 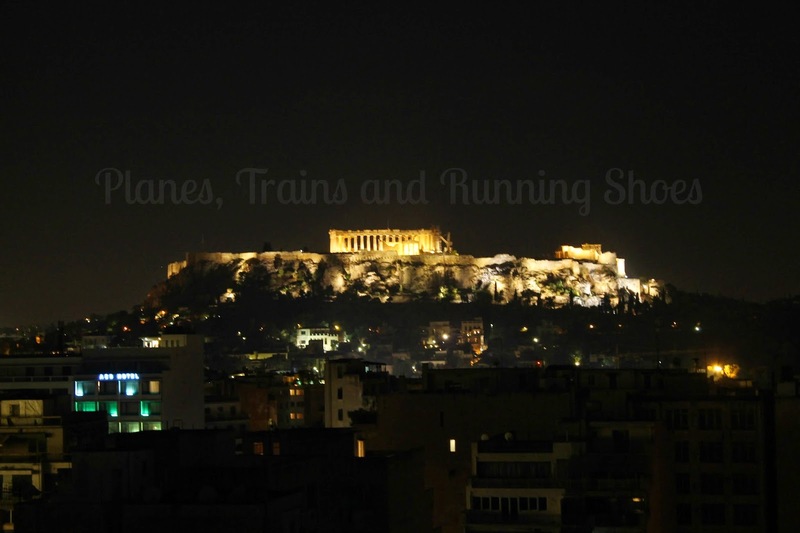 Not only is it the site of the very first modern Olympic Games, but it was the Finish of the 2004 Olympic Marathon and is the Finish of the Athens Marathon! I loved that they had a podium set up with an Olympic crown for us to play with! They even had a room which has all of the Olympic torches from every Olympics! Above, the torch from the 2008 Beijing Olympics. I loved that they pay homage to the Olympics, year after year, not just the 2004 Games in Athens. The bottom left picture lists the location of every Olympics since the first one held right there in that stadium. It was so awesome! After visiting the Olympic Stadium, we meandered over to visit the last of the ruins that we hadn't seen before grabbing a late lunch. After lunch, we made our way to the Port to pick up our ferry tickets for the next day. We were taking a 7am ferry out of Piraeus and we wanted to pick up our tickets the night before. I'm so glad we did, because it took us close to an hour just to find where we needed to pick up the tickets, since the confirmation we had listed the wrong dock. Since we had such an early start the next morning, we picked up our tickets and made our way back to the hotel to get some rest before our early wake up call! We had been told not to spend more than a day in Athens, and that was exactly what we needed. We skipped all of the museums. Had I been there for another day, I probably would have gone to the Acropolis Museum, but the idea of seeing items that had been taken off of the Acropolis and put into a museum didn't appeal to me as much as seeing them in their 'natural' habitats, so we skipped that. One day in Athens was perfect. We saw everything there was to see, explored the city a bit, and got a good introduction to Greece. 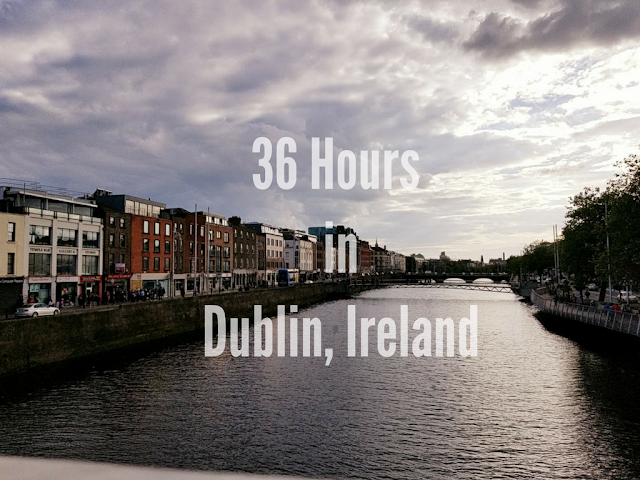 We stayed at the Dorian Inn Hotel for 69 euros per night. The hotel had a good breakfast, was close to a metro, and had a great view, but it wasn't in the best neighborhood. We got around using the metro. We each bought a 24 hour ticket for 4 euros. Our highlight was definitely the Olympic Stadium. Ive heard that one day in Athens is all you need--looks like you guys did it up right! Looks like a jam packed and awesome day! How exciting!! We never got around to taking a Honeymoon, so I love living vicariously through others!